Globes are always powerful symbols and more and more use of them is being made in the online world, largely as a result of the impact that Google Earth has had and people’s appetite for rotating, panning and zooming earth-like objects. 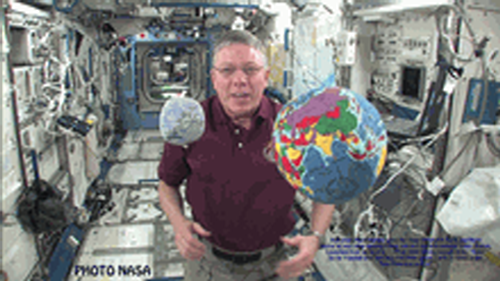 We have always spun globes…we are just now able to do it digitally as well as we can the desk globe. Moritz Stefaner, in collaboration with Studio NAND, Medienfabrik and Jens Franke have designed a truly abstract globe to act as a container for thematic detail relating to FIFA’s football related educational activities worldwide. The digital medium supports such an abstract approach well with countries and continents constructed from tessalated triangles. Triangles also follow through to the symbology used to represent the different activity with numeric and qualitative information being assigned. 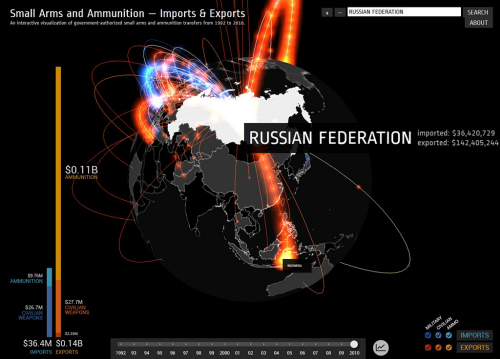 Symbols can be filtered and, of course, the globe can be manipulated to focus on specific countries. As the globe spins we see the inverse of landmasses through what is, in effect, a transparent model. This could cause visual clutter but the elegant abstract nature of the approach allows the design to capitalize on the aesthetic. Colours, graphs, statistics and navigation are all intuitive and the application performs smoothly. There are focus-context changes made all the time as you spin the globe to bring different information into view and you can filter any amount of the content. There’s even an ambient low-level soundtrack to provide an aural abstract experience at the same time as interacting with the globe and various clicks and indications that some state change has been implemented by the user controlling the map. A globe is an enjoyable experience because it’s tactile and allows you to see what’s round the corner as it is spun. This digital version is no less tactile which is a success for a digital application. More detail on Moritz Stefaner’s web site here. Globes. Possibly the finest representation of the planet in map form that exists. No need to be concerned about the awkward process of mathematically crow-barring the earth’s detail onto a flat map or a computer screen. No digital devices to be bothered with. A simple, spherical, physical model that shows us how the planet actually is – a three-dimensional physical object represented perfectly by a three-dimensional physical object. Most of us at one time or another have spun a globe in a classroom or on a desk. Many of us own a globe…most likely one made of a plastic printed shell, possibly that lights up and if you look closely you’ll likely find lines of latitude that don’t quite line up and overlaps of bits of countries and text. But not all globes are created equally and Peter Bellerby’s globes are exquisite. In an era where digital is surpassing physical it was a brave man who decided to build his own globe making company. Bellerby did just that in 2008. He wanted to get a globe as a present for his father’s 80th birthday but couldn’t find one suitable…so he set about making his own and thus his company was born. Making globes is no easy task. Making high quality globes even harder and his story is one of dogged persistence in achieving perfection. Peter Bellerby – The Globemaker from Cabnine. 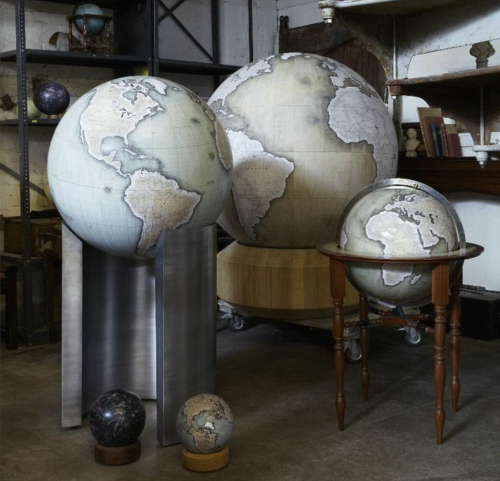 Bellerby’s collection includes a wide range of globes from the 12″ desk globe shown here to massive 50″ Churchill globes. Each is hand-crafted, involving Formula 1 racing car fabrication techniques (to create a perfect sphere) and then hand painted. As maps they are simply beautiful with colour being expertley applied and labels sitting perfectly across the map. Of course, each globe can be customised to whatever requirements you wish but the standard desk globe is a perfectly balanced piece of work without modification. As a globe, the maps take on an extra dimension quite literally. The exacting construction means the gores line up perfectly and as you’d expect the map itself is based on up-to-date information and correct at the time of construction. The desk version weighs 3kg and sits atop a hand made black walnut plinth housing roller-bearings that allows the globe to glide and rotate effortlessly. This is the very essence of engaging with a map – to touch it and to feel it as you control its movement with perfect fluidity. You cannot just make a globe without a fine attention to detail. Precision and craftsmanship are what sets these globes apart and makes them not only unique but masterpieces of cartography. These globes are made to last and have brought a dying art back to the fore. 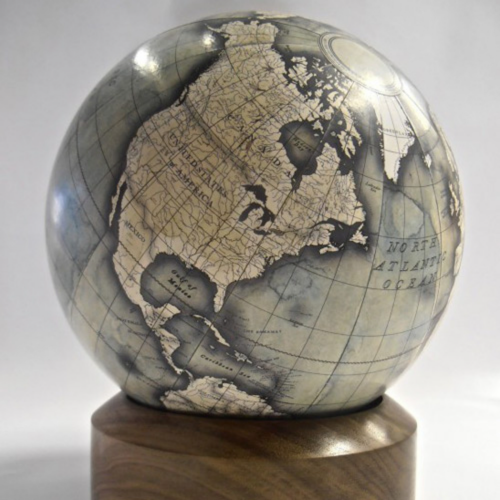 Peter Bellerby has resurrected the lost art of high quality globe making and his globes are literally out of this world. For a more detailed exploration of Bellerby’s history, collection and processes visit his web site here.